Guardians of the Galaxy Vol. 2 is an upcoming American superhero film based on the Marvel Comics superhero team Guardians of the Galaxy, produced by Marvel Studios and distributed by Walt Disney Studios Motion Pictures. This is supposed to be the sequel to 2014’s Guardians of the Galaxy and the fifteenth film in the Marvel Cinematic Universe. 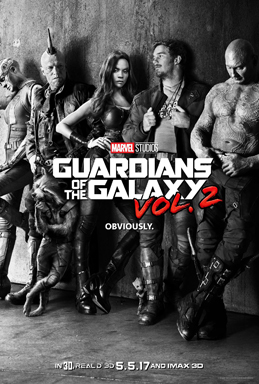 The film is written and directed by James Gunn and stars an ensemble cast featuring Chris Pratt, Zoe Saldana, Dave Bautista, Vin Diesel, Bradley Cooper, Michael Rooker, Karen Gillan, Sean Gunn, Glenn Close, Pom Klementieff, Elizabeth Debicki, Chris Sullivan, and Kurt Russell. In Guardians of the Galaxy Vol. 2, the Guardians travel throughout the cosmos as they help Peter Quill learn more about his true parentage.